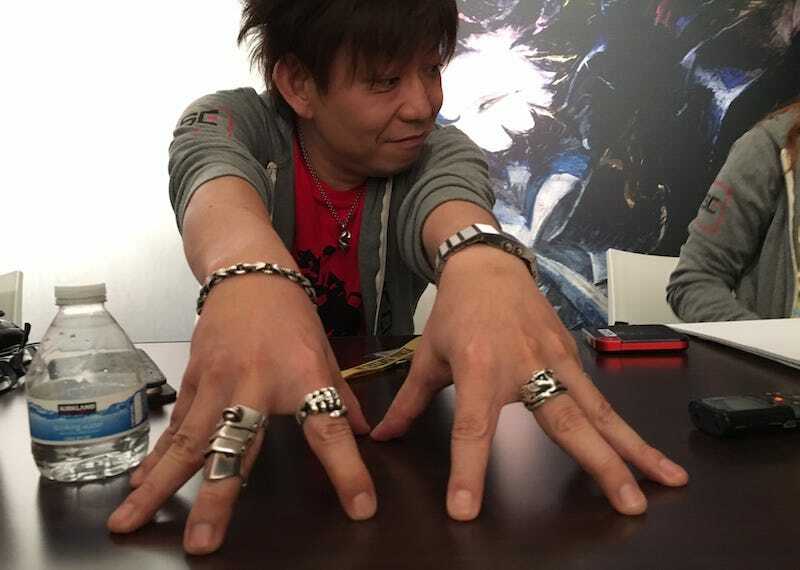 Naoki Yoshida just wouldn’t stop looking at his computer. The beloved producer, credited with transforming Final Fantasy XIV from disaster to dream MMORPG, kept typing and clicking as I spoke to him last week in a private room at E3, frowning occasionally. So I asked what he was looking at. That was Thursday, June 15, a day before the early access launch of Final Fantasy XIV’s newest expansion, Stormblood. In the days following our chat, Stormblood would run into a series of server issues that undoubtedly led to much more frantic clicking, typing, and frowning. The servers have settled now—and fans are loving Stormblood’s new quests and dungeons—but it was a rocky first week. Yet Naoki Yoshida is still having a blast. He’s been director and producer of Final Fantasy XIV for nearly five years, ushering it from the disastrous 1.0 launch to the well-received A Realm Reborn and its stellar first expansion, Heavensward. And all the while, he’s interacted directly with fans, speaking to hundreds of thousands of Final Fantasy XIV devotees through weekly streams and Q&As. It’s been a long, grueling journey—but Yoshida’s not interested in retiring. “I think we’d need at least another two more expansions,” Yoshida said. Yoshida: This is my personal thought and not anything that’s set in stone. Looking at some of the areas in A Realm Reborn, our [original] 2.0 areas, that was when we were making updates to the original 1.0 and rebuilding the world from scratch in such a short time. So if you look back at it now, we can’t enable flying, a lot of the side quests have been so accumulated that it’s become a hassle. Now that the development team has game experience of running the MMO, I do notice a lot of points that could be improved upon, and to be quite honest, it would be nice if I could rebuild the areas of A Realm Reborn. Schreier: So is Black Mage going to be overpowered in Stormblood? Yoshida: I don’t think so. The Black Mage has never been overpowered at all. It’s really funny because a lot of players out there who do main as a Black Mage make comments like, ‘Yoshida, stop using the Black Mage,’ because I have a relatively high player skill level, and I’m very careful in making the adjustments to that particular job, so they don’t become overpowered at all. People actually complain about it. Yoshida: One of the biggest challenges we had was the hardware trying to access files—the IO, or in and out... The speed at which some of the files are being read on the [PS3] hardware and then transferred into memory was slower compared to some of the other platforms. This is a 10-year-old-plus piece of equipment. Where that caused an issue for Final Fantasy XIV was that for example if the player is moving across the field at a relatively fast speed, some of the NPCs or the other characters would not show up as smoothly as on other platforms. Because the speed at which the files were being read was slow, you did see a difference in the way it’s being displayed on screen. So there always had to be a cap so we could accommodate for that hardware capabilities. But now that we are phasing out of that platform, not having that bottleneck anymore, we have made improvements on usabilities. One example is, as of 4.0 Stormblood, your ground mounts can travel faster now. Yoshida: Plans for these are moving forward. The Final Fantasy XV team has settled down on their end. We feel that it’s going to be rather hefty in volume in terms of this crossover. Once we are able to get some visual references, some graphics available, and when we decide on timing, we’ll make sure to make an official announcement. Yoshida: I’ve said this on several occasions, but it hasn’t changed. We would love for as many players to be on FFXIV as possible. Conversations have been had with Mr. Phil Spencer of Microsoft, and the upper management teams of Nintendo. But I have proposed a condition every time I speak with any platform manufacturers. It’s that the game has to have the capability of cross-platform play. If we are able to come to some sort of agreement, a handshake so to speak, or if it does end up being that unfortunately we can’t do a handshake with Final Fantasy XIV, either way we’ll make sure to communicate with our players. But we have been tenacious—we’ve been trying to keep at it and be persistent about our conversations.